“Activating History for Justice at Duke” joins Duke to efforts at schools like Brown, Georgetown, Yale and the University of North Carolina to rethink how the past in represented on campus. 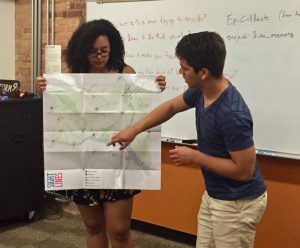 During their Bass Connections project, “Constructing Memory at Duke,” Duke students researched in the University Archives, mapped campus sites and designed their own proposed sites. The full report is available here. 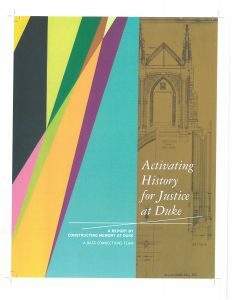 This report recommends that Duke University expand efforts to acknowledge, engage with and activate its past, and include ties to slavery, white supremacy and segregation; unfair and discriminatory labor practices; benefits from a lethal product, tobacco; and discrimination against women, LGBTQIA+ and disabled people and people of color. Duke should also seek to identify and celebrate our diverse forbears, among them those who integrated the university. Students logged over 327 sites where Duke represents its history. At least 53 per cent represent white men. 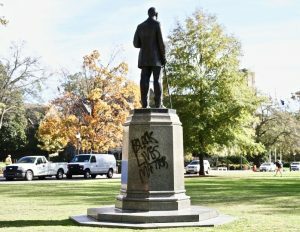 Among them are slave-owners and white supremacists, among them Braxton Craven and Julian S. Carr, whose name is on the East Campus Building housing the History department. Women are represented in less than 15 per cent of Duke’s sites. Of all sites, only eight represent staff. As far as our data shows, all of those staff members were or are white. Seventy per cent of Duke’s sites represent white people of any gender. Excluding repeats of individuals, less than 3 per cent of sites represent black people. Asians or Asian-Americans are represented in roughly 1 per cent of all Duke sites. Native Americans are represented in 0.003 per cent of sites (one student is named in a section of one exhibit). Apart from the Center for Gender and Sexual Diversity, there are two LGBTQIA+ sites: Walt Whitman, who had no relationship to Duke; and Prof. Reynolds Price, who is usually not recognized as queer, a term he preferred. We found no sites representing Latinx members of the Duke community. To help make the case that important stories are undervalued or untold, students assembled a Story Bank drawn from the University Archives to show key figures and moments that should be recognized at Duke. Among them are the story of George Wall, a former slave who was among the only employees of Trinity College, Duke’s precursor, to move from Randolph County to Durham; and Lillian Griggs, a pioneering librarian who created the first book mobile. Students also proposed honoring the activists who pushed to make the campus a place that welcomed a more diverse student body. Among them they singled out Oliver Harvey, a long-time Duke employee to led the effort to unionize Duke workers. The report features eight proposed sites designed by students that honor people of color, women and values like free speech. Duke has already made steps to acknowledge its past, including with the removal of the name of Charles Aycock in 2014 and the dedication of a new plaque to architect Julian F. Abele in 2016.